Epiphany Day was celebrated by the Greek Orthodox Church in Izmir, Turkey, for the first time in 94 years and in Famagusta after a 42-year-old absence. Also known as Theofania or Fota, it is celebrated across Greece each year on January 6 commemorating the baptism of Jesus Christ by John the Baptist, according to the Orthodox Church. 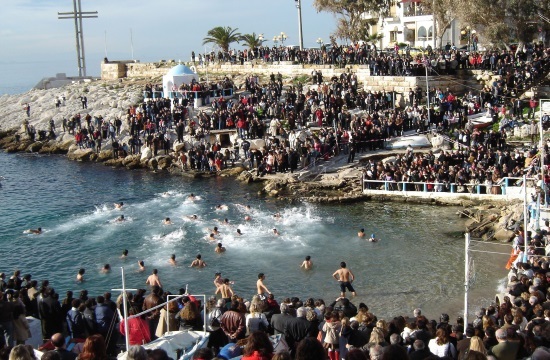 During Theofania, priests in all Greek cities and villages bless the waters by throwing a cross into a sea, lake or river while many brave swimmers jump into the cold waters to catch the Cross and get the priest’s blessing for the year. If there is no living water nearby, the Blessing ceremony is hold outside the church with a baptism font filled with water. People take the Holy Water at home and sprinkle their house, their fields, their animals and they also drink it. According to Greek Orthodox Church, on that day a miracle happens as the nature of water changes and becomes incorrupt. In Athens, Greek President Prokopis Pavlopoulos called for “the light to smash the darkness of poverty” as he attended Epiphany celebrations along with other political leaders. This year, for the first time since the Asia Minor Catastrophe of 1922, a Greek Orthodox Epiphany celebration took place in Izmir on January 6, 2016. The Greek Orthodox community received permission from the Turkish authorities to perform the Diving for the Holy Cross ceremony on the local pier. At least three groups have travelled from Athens, Mytilene and Chios to Izmir in order to attend the Epiphany celebration. “We hope that since we have created an orthodox community here, we can create something that will continue on,” explained Father Kyrillos Sykis. At the moment, the Orthodox community of Izmir includes about 300 Greeks, while there are also Russians, Georgians and other Orthodox ethnicities, bringing the total between 7,000 and 8,000 people. At the same time, Orthodox Christians in Cyprus have once again observed the Epiphany in Famagusta on Wednesday, marking the festivity in the ancient town after a 42-year-old absence. Due to the division on the island, Greek Cypriot believers hailing from Famagusta had to celebrate the Epiphany, known locally as Theofania or the Feast of Lights, in towns and districts away from the land where they were born and raised.